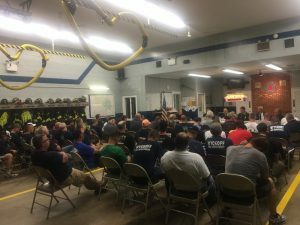 Last night, the Wyckoff Fire Department gathered at Co. 3 for their third departmental meeting of the year. During the meeting, the new departmental officers for 2017 were elected: Tim Brock as Departmental Chief, Joe Vanderplaat as Assistant Chief, Paul Kasabian as Treasurer, and Tom Risseeuw as Secretary. Congrats to all! We we would also like to thank a resident for donating a catered meal to the department for dinner after the meeting. It was much appreciated!